Edmonton, Canada, August 21-23, 2014. 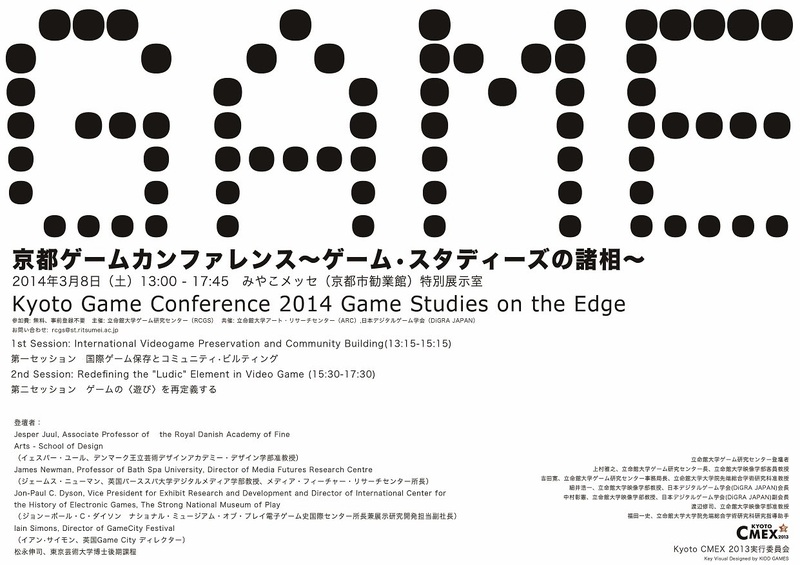 This conference is organized in collaboration with the Ritsumeikan Center for Game Studies, the Prince Takamado Japan Centre and the University of Alberta with support from the GRAND Network of Centres of Excellence. The conference is the third collaboratively organized conference focusing broadly on Japanese game culture, education and industry. It aims to bring together a large range of researchers and creators from a broad range of different country to present and exchange their work. Please send abstracts of no more than 500 words via email to , before April 1st, 2014. Figures, tables and references, which do not count towards the 500 words, may be included on a second page. Please submit your anonymized abstract (and supporting second page) in PDF format with a just title. The following information should be in the accompanying email message: Type of submission (poster/demonstration or paper), Title of submission, Name of author(s), Affiliation(s), Address(es), Phone (and Fax) number(s), and Email address(es). Notification of acceptance will be send out by April 15th, 2014. Abstracts will be accepted in English or Japanese. While the language of this conference will be English, Abstracts, Posters and PowerPoint slides will be translated into both languages. For those who can’t present in English there will be translation help on demand. For more information about the International Conference on Japan Game Studies 2014, visit the conference home page or write .